Stores reference 22c/877. Size 1. The leather is in good supple condition but a little soiled. All straps are very good and retain virtually all of the original coatings on the press studs. The lining is generally very clean and has faint size and A.I.D marks. Both rubber receiver carriers remain reasonably flexible and the chinstrap retains good strong colour and a little elasticity. Wired with a super light tan coloured loom and chipped black cased bell jackplug (no receivers). 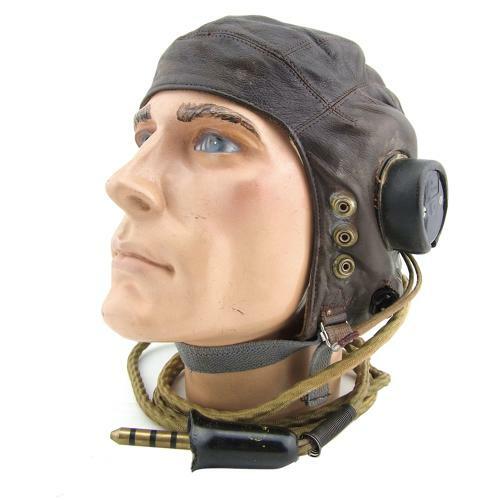 This is a very small helmet but a good, probably unissued example of the rarer first pattern / early internally wired C-type of definite wartime manufacture. Please note that the receivers are NOT included in the sale and are shown for illustrative purposese only and to retain the shape of the receiver carriers. Stock code H22598.